Nice =) I'm honestly leaning towards a TD61 or TDX61 to replace my PT6265 when it dies. It's hard to say what the best is. For the street I like smaller turbo or some of the medium ones. 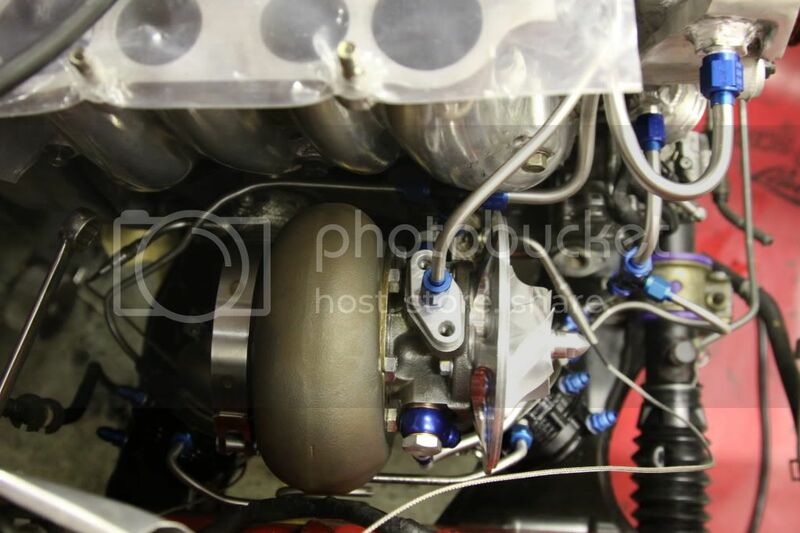 For track and racing, perhaps a larger turbo would be better for lower EGT's.....and for more power. I like the smaller to medium T04e, EFR7670, GT35R, GT3574R sized ones. Post up pics of your work progress, engine bay, etc. mate and enjoy your Fosters! I'll start by saying I'm no turbo expert...period. And can only provide my own data point. My own research and that of a good friend of mine(see here: http://www.reganrotaryracing.com/fel...oselection.htm ) indicated the best *compromise* for my purpose and my goals was the GT35R. And that was: decent power, lower boost, reliability at the track, and ease of maintenance. For this the GT35R fit the bill. With my other mods: it makes 422rwhp at 15psi on 93 fuel with no WI. I can pound it at the track lap after lap (or at least i used to since I haven't been for a while), and it's plenty fast on the street...wait scratch that...scary fast... bordering on uncontrollable on the street unless it's pointed in a straight line. Anything approaching 500rwhp for street can, and even on the track, comes with significant downsides that IMO outweigh the BIG power numbers, unless you ar just into bragging rights. if I could do anything differently today it would only be to switch to a T4 divided manifold. Other than that I wouldn't touch a thing. Refer to my website if you would like more details. Did you seriously just say that.... Fosters..... im insulted. I'll start by saying I'm no turbo expert...period. And can only provide my own data point. My own research and that of a good friend of mine(see here: GENE FELBER ARCHIVE: SINGLE TURBO SELECTION ) indicated the best *compromise* for my purpose and my goals was the GT35R. And that was: decent power, lower boost, reliability at the track, and ease of maintenance. If it wasn't for the TDX16 i was going to go with the GT35, however for me it is a no brainer between the two, with out meaning to sound rude i cant see why the GT35 is an option? i looked at the spool comparison and there i not much between the two at most 50 rpm, the TDX16 makes more power at less boost and can be setup all the way to 28PSI if you wanted to. The way i see it its a GT35 with more range for growing in the future. The TDX61R also offers lower exhaust manifold back pressure and EGTs compared to a GT35R since it has a larger turbine wheel. This is important for engine and turbo longevity on the track. Just going through the motion of buying the kit from Turblown, so i started stripping the car today, lucky thing i did! 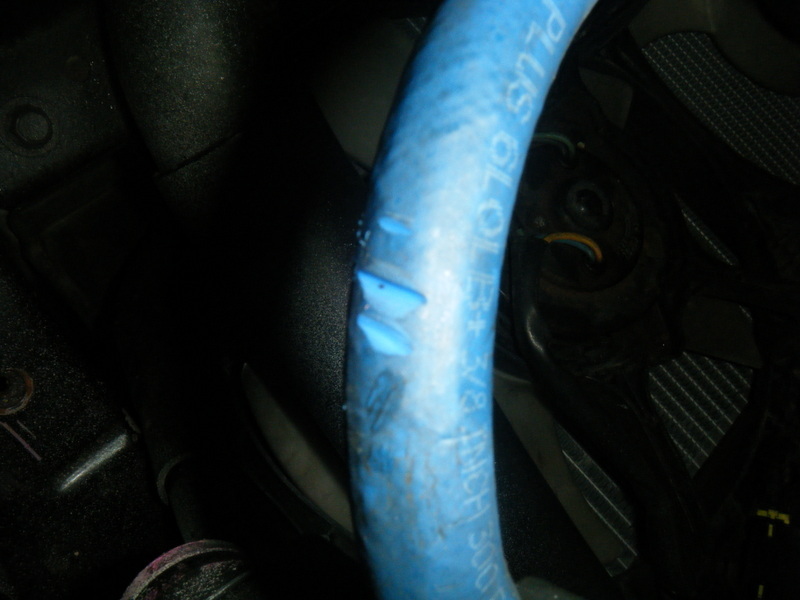 just found a coolant hose from the AST to filler neck nearly worn all the way through, the dump valve had been rubbing on it would have been messy if i didnt spot it, picture below. 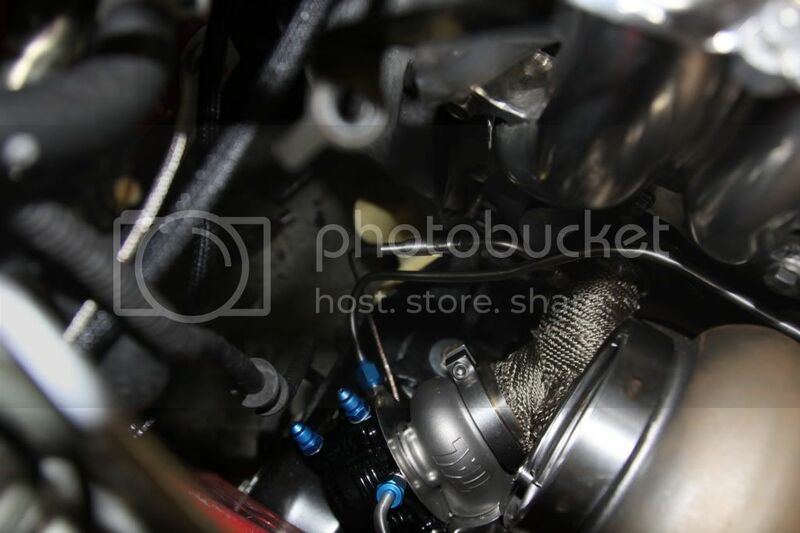 Also Turblown sell Turbosmart wastegates, to be honest i only knew of Tial being any good, but i guess i will find out. Also another side step from the actual thread, sorry, also excuse the stupid question, can you look at the pictures below and confirm if i have twin oil coolers? or is one for power steering fluid? Yes, those are twin oil coolers. 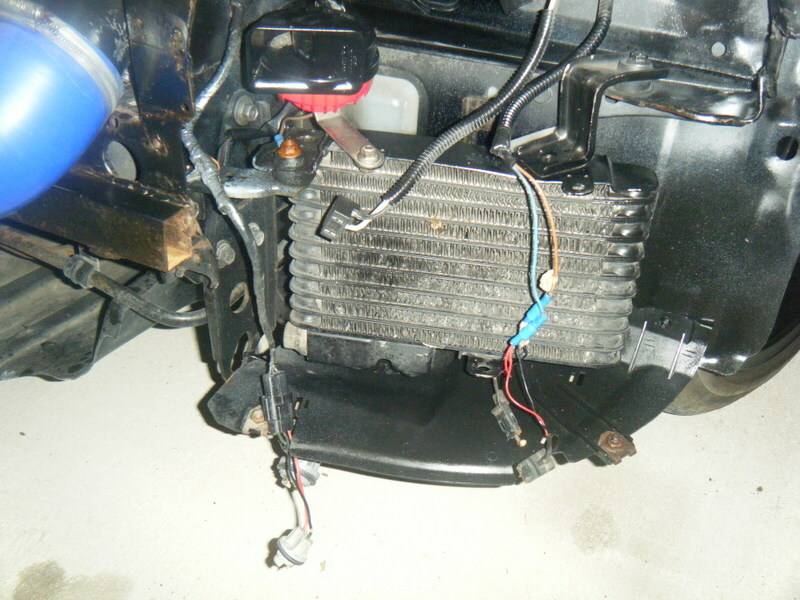 The power steering cooler is the small tube thing in front of the AC condenser. Sweet, is that after market thee pipe work looks old. i was told its a 1993 model. I like HKS which haven't given me problems. I've lost some diaphragms on the tial wastegates so I wouldn't choose to use one again unless it came with a kit I bought or something. I've heard the turbosmart are equal to Tial but cost less. 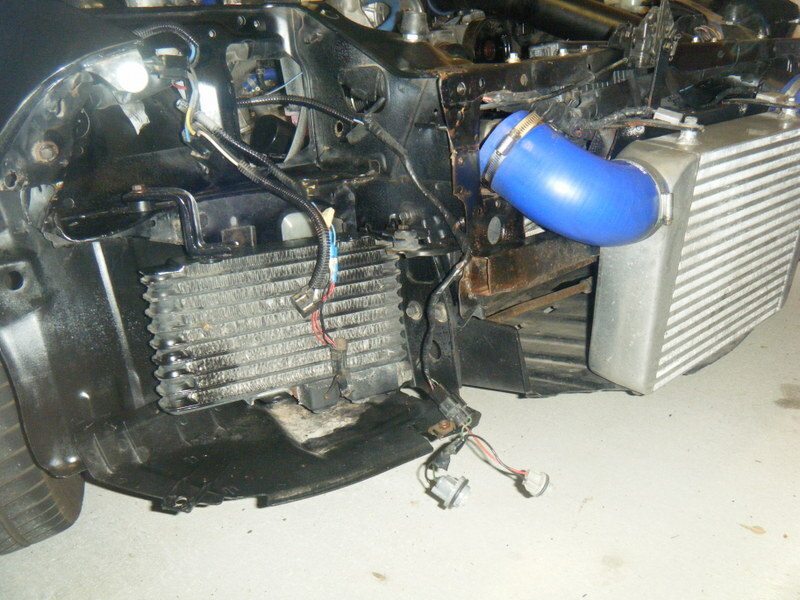 Again though if I'm putting a kit together I'd just buy an old school HKS 50mm race waste gate which may cost 200 more but it's worth it (handles heat well). 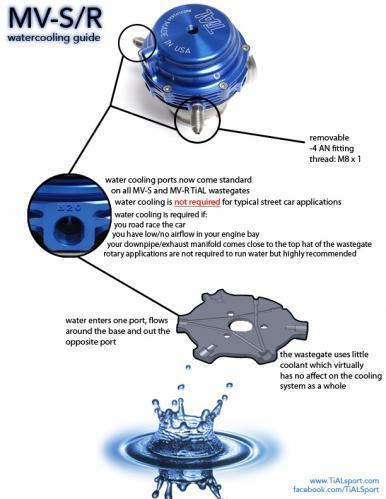 The Tial MVR 44 has water cooling capability to prevent diaphragm damage. I water cooled mine and so far no problems, but I only have 1 track day on them so far. I had changed the wastegate springs a few months ago and the diaphragms still looked like new, FWIW. Did you run hard or soft lines and where did you tee in or is your turbo just oil cooled? Also sounds like you are using two wastegates? I seriously doubt you'll have any issues at all with your setup. Mine wasn't water cooled and it sits about 2mm away from the DP (aspec kit). Hard lines. Stainless steel 316l. 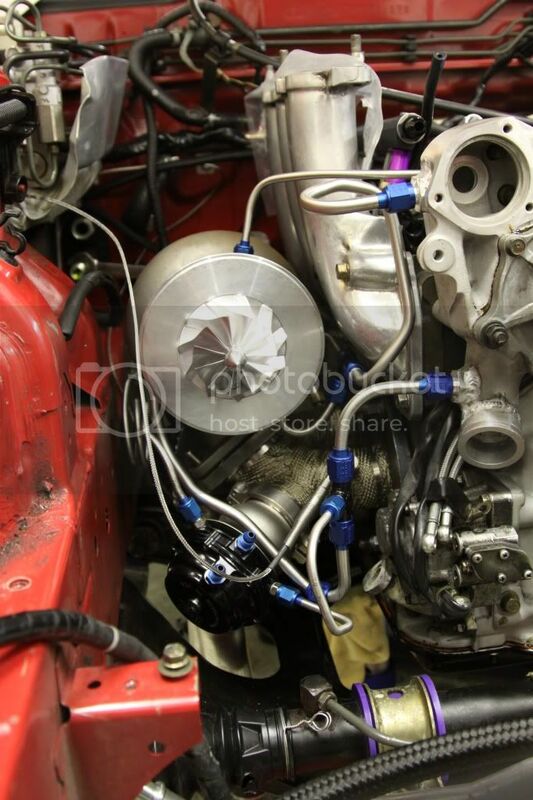 I also finished the turbo and wastegate coolant line routing, you can also see in the pic my oil turbo feed line. Just saw your build thread...........and JUST WOW!!!!! can't wait to see that thing at the track sometime. Thanks, there is more than 40 hours of work for me to make those hardlines. I really want to get to VIR this year. A-Spec has been offering the MVR and MVS for some time now, although the Precision gates are the 'standard' offering. Look forward to seeing you THIS YEAR at VIR. Pete and I will be there in March with Zone 2 (or 1st settlers or one of the porsche groups.....see what I'm talking about now if only I could find my medication hehe). The water cooled MVR has been our standard go-to wastegate for most mid frame custom turbo kits that we put together for customers' cars. Fritz we've been using these since the day they came out, I recommend the precision gates simply because for awhile the TiAL gates were failing until they water cooled them, now it's basically up to the customer as to which they prefer. If you do not water cool the TiAL gates you do run the risk of failure, it is more a function of the Diaphragm being so close the the valve body than anything else, they were failing on setups with the gate no where near a header or DP. Last edited by Zero R; 02-18-13 at 11:13 AM. Is this 40 hours of work for you to do it or typically 40 hours for anyone? I think im going to water cooler the twin tials on my kit. It was 40 hours to make the wastegate coolant lines, the turbo coolant lines, the turbo feed line, the turbo oil drain line, and the wastegate boost control lines. Having done it once and I now know the routing, I could probably do it in half the time. Note: I used stainless line, it is much harder to bend than aluminum tubing. Ok not sure what to do, can you guys give me some suggestions, the DP that comes with the kit is 3.5” my exhaust is only 3”, should I get a full 3.5” system or just reduce it at some point in the system, also where could I get this from?